Can you tell I'm a bit of a pack rat? Well if not, I am telling you I have a problem. Yeah I'm a big pack rat. A very well organized one. You would totally be surprised what I can fit into a small box. When I first moved out of my mothers house I had my 94 blue, pink and purple tracker and a pick up truck load of stuff. That is it. I moved all the way from Michigan to Florida. Why is another story. After a year in Florida of working 50+ hours a week and going to college full time, my then boyfriend at the time and I decided to pack up and move to southern California. We had a Malibu (my poor tracker got totaled in Florida) a dog and one small uhaul of stuff. No mattress, no furniture, nada. It was fun. I love it. Then we got a tiny studio apartment and all of a sudden the pack rat inside came out to play. Ever since then I have had a problem. Even more after we tripled our space and moved into a one bedroom. But not this year. This year I will not live in clutter. I will purge and organize and downsize. 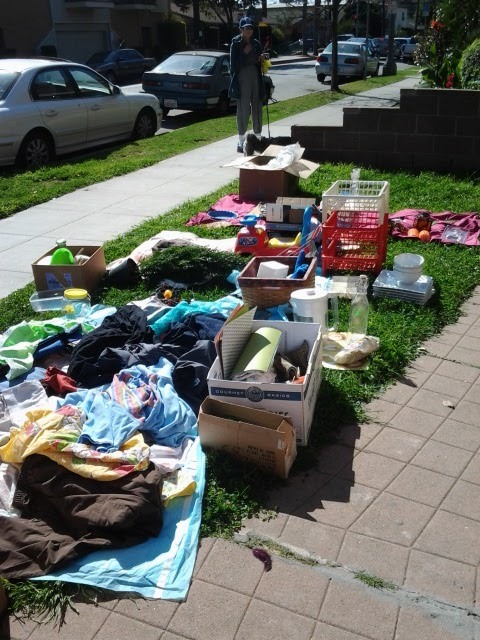 About an hour into the yard sale. Not pictured is the furniture. 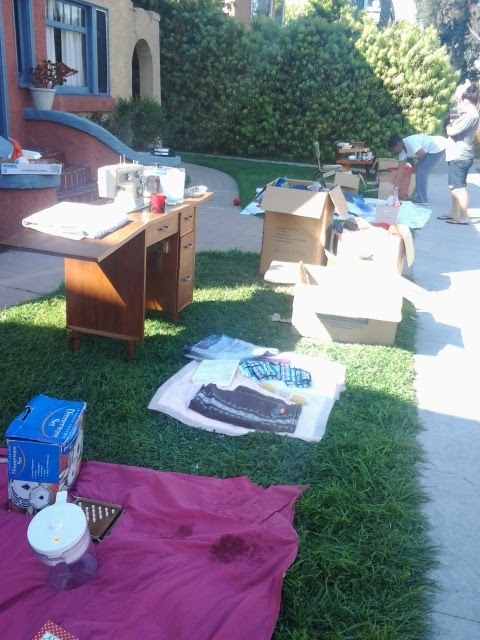 This is we're the yard sale comes in. I had it Saturday March 10th. THH helped take everything down stairs. THM was not to sure about it the few weeks before. I don't thing he wanted to see some of his smaller clothes go. Oh well, time to purge. He did really great and even made a few bucks for himself. Sold all 4 boxes of baby cloths. Told a lady at the end of the day to take them all for $5. She did! Less to haul to SA!!! The goal is 2012 things gone in the year 2012. I'm hoping to get even more gone. I haven't been to Joann's all year. I've been using my fabric stash. I have been getting new Pyrex though. About an hour before we quit. Look at it all gone!!! I sold a ton. 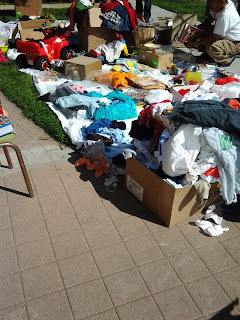 So much on Saturday that we didn't even want to do it Sunday and took everything to good ole Salvation army. And I even shopped a bit and found nothing! Sad day for me, I must have got all the goodies the day before. Oh And that boyfriend became my husband and father to my child. LOVE! My pack rat days are behind me, hopefully.